The Outline of an Irish Terrier is characteristic. He is not a square dog, he is longer in the body than he is tall. The length should come from “well ribbed back”, not from a long loin. He must have substance while at the same time be built on the lines of speed, showing a graceful athletic outline. When required an Irish Terrier should be alert and on his toes and displaying an assertive presence. He is loyal and devoted to his family. Without a typical Irish Terrier expression, the best terrier in the world just becomes a dog. Expression is one of the most important physical characteristics of an Irish Terrier. By his head an Irish Terrier is first recognized and last remembered, because the challenging piercing expression is unlike the expression of any other member of the canine family. All exhibitors, judges but more importantly breeders must always carry in their minds the hard bitten “devil may care” expression which is so necessary and so desirable in the breed. The daredevil Irish Terrier expression begins with a long, balanced head that is clean in the cheek. The correct skull is flat. The eyes appear small and not prominent because they are set moderately deep into the skull with good fill underneath them. Small dark eyes are the focal point of expression. The Standard describes them as “full of life, fire and intelligence”. The distinctive ear set of an Irish Terrier adds the finishing touch to the keen expression. The ears are set and carried differently to any other Terrier. Small and V Shaped, they are set well above the level of the skull, with the tips falling over and approaching the eye corners. 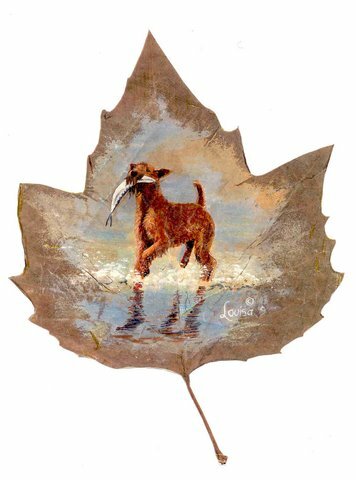 The knowledge and understanding of true Irish Terrier expression is the key to maintaining the distinctiveness of the breed. The Irish Terrier must have a dense, harsh, wiry, double coat, which is broken in appearance but still lying flat. The colour should be whole coloured, red, yellow red, red wheaten. All are equally correct. A small patch of white on the chest is permissible. May not be reprinted without written permission of the All Ireland Irish Terrier Club. Grateful thanks to the hard working Committee of the Club for their input in this Essence. We hope it will lead to a greater understanding of the Irish Terrier.